So says Ben Mountifield (www.247Bull.com) in edited excerpts from his original article*. Lorimer Wilson, editor of www.munKNEE.com (Your Key to Making Money!) and www.FinancialArticleSummariesToday.com (A site for sore eyes and inquisitive minds) has edited the article below for length and clarity – see Editor’s Note at the bottom of the page. This paragraph must be included in any article re-posting to avoid copyright infringement. The amount of sovereign debt that is due to mature in the next few years is so vast that it’s highly unlikely that there will be enough buyers to meet the supply. If central banks do nothing, then the oversupply of debt will bring about higher interest rates and therefore higher debt servicing costs. For many of the world’s economies, however, even a modest rise in interest rates would cause a very serious problem. In the U.S. for example, where the average interest rate for a 10-year Treasury is currently 2.3%, it takes around 8% of federal revenues to service the national debt. However, if the deficit continues to rise at more than $1 trillion a year, and the average interest rate on 10-year Treasuries rises to just 3%, then by 2020 the cost of servicing the debt could rise to more than 20% of federal revenues. Governments will therefore be very reluctance to let interest rates rise. As a result I expect them to instruct their central banks to step in and monetise a large portion of this maturing debt. I.e., they will purchase their own debt with newly printed money. Between now and the end of 2014 the world’s top 10 debtor nations have to rollover $12.7 trillion (£8.2 trillion) in maturing sovereign debt. That’s more than 40% of their total outstanding debt. In other words, in the next two and a half years these nations need to find buyers for debt that is equivalent to the combined economic output of Germany, France, Brazil, the United Kingdom and Australia. When faced with a choice between massive money printing and a global depression, I am confident that world leaders will choose the path of least resistance. I.e., they will continue to print money in ever greater quantities. 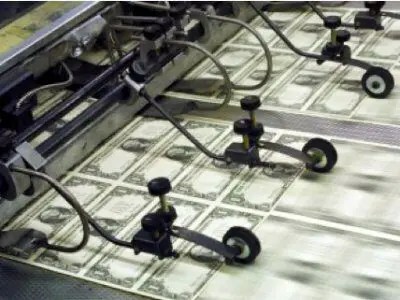 The problem of course, is that printing money is highly inflationary and it is my opinion that the actions of desperate governments will create a prolonged period of hyper-stagflation. In other words, a period of high unemployment, low, or no, economic growth and high inflation. It is possible, perhaps even likely, that we will see inflation rates as high as they were during the 1970’s, something which will have significant consequences for every investor, or anyone with wealth. This bout of high inflation, brought about by rapid currency debasement, will destroy a good portion of the wealth and savings of millions of people. This destruction of wealth will likely be the trigger for the final stage of the crisis, i.e. the loss of confidence in paper (fiat) money. It is also likely to be the catalyst for the resumption of the bull market in precious metals. Those who wish to take per-emptive measures to protect themselves from this period of tremendous wealth destruction should consider accumulating physical gold. Gold won’t make you wealthy but it will help keep you wealthy. Other assets that should perform well in this environment include: silver, copper, prime residential property, farmland and precious metals mining stocks. Editor’s Note: The above post may have been edited ([ ]), abridged (…), and reformatted (including the title, some sub-titles and bold/italics emphases) for the sake of clarity and brevity to ensure a fast and easy read. The article’s views and conclusions are unaltered and no personal comments have been included to maintain the integrity of the original article. Next GOLDRUNNER: THE FED, DEBT, AND GOLD- Pt. 2- Follow the dots . . . . . . .